Amidst the hoopla about the new MacBook and much-anticipated Apple Watch, Apple snuck something into Monday’s event that blew me away (obligatory disclaimer: I work part-time at The Apple Store, but the opinions expressed here are mine). Four years after I proselytized about the virtues of democratizing data in my Data Dynamite: how liberating data will transform our world book (BTW: pardon the hubris, but I still think it’s the best thing out there about the attitudinal shift needed to capitalize on sharing data), I was so excited to learn about the new ResearchKit. The other new announcements might improve your quality of life. This one might save it! A range of factors cast a pall over traditional medical research. Researchers have had to cast a broad net even to get 50-100 volunteers for a clinical trial (and may have to pay them, to boot, placing the results validity when applied to the general population in doubt). The data has often been subjective (in the example Williams mentioned, Parkinson’s patients are classified by a doctor simply on the basis of walking a few feet). Also, communication about the project has been almost exclusively one way, from the researcher to the patient, and limited, at best. What if, instead, you just had to turn on your phone and open a simple app to participate? As the website says, “Each one [smartphone] is equipped with powerful processors and advanced sensors that can track movement, take measurements, and record information — functions that are perfect for medical studies.” Suddenly research can be worldwide, and involve millions of diverse participants, increasing the data’s amount and validity (There’s a crowdsourcing research precedent: lot of us have been participating in scientific crowdsourcing for almost 20 years, by installing the SETI@Home software that runs in the background on our computers, analyzing data from deep space to see if ET is trying to check in)! “When granted permission by the user, apps can access data from the Health app such as weight, blood pressure, glucose levels and asthma inhaler use, which are measured by third-party devices and apps…. ResearchKit can also request from a user, access to the accelerometer, microphone, gyroscope and GPS sensors in iPhone to gain insight into a patient’s gait, motor impairment, fitness, speech and memory. 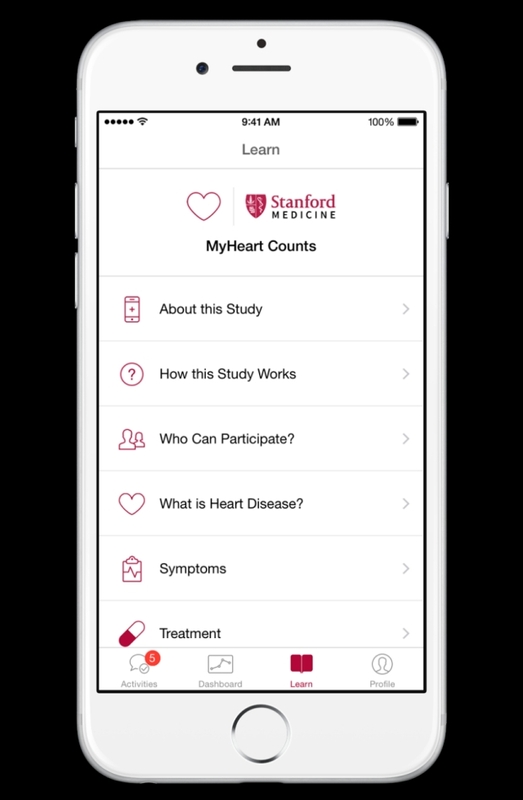 Apple announced that it has already collaborated with some of the world’s most prestigious medical institutions, including Mass General, Dana-Farber, Stanford Medical, Cornell and many others, to develop apps using ResearchKit. The first five apps target asthma, breast cancer, cardiovascular disease, diabetes and Parkinson’s disease. My favorite, because it affects the largest number of people, is the My Heart Counts one. It uses the iPhone’s built-in motion sensors to track participants’ activity, collecting data during a 6-minute walk test from those who are able to walk that long. If participants also have a wearable activity device connecting with the Health app (aside: still don’t know why my Jawbone UP data doesn’t flow to the Health app, even though I made the link) , they are encouraged to use that as well. Participants will also enter data about their heart disease risk factors and their lab tests readings to get feedback on their chances of developing heart disease and their “heart age.” Imagine the treasure trove of cardiac data it will yield! A critical aspect of why I think ResearchKit will be have a significant impact is that Apple decided t0 make it open source, so that anyone can tinker with the code and improve it (aside: has Apple EVER made ANYTHING open source? Doubt it! That alone is noteworthy). Also, it’s important to note, in light of the extreme sensitivity of any personal health data, that Apple guarantees that it will not have access to any of the personal data. Because of my preoccupation with “Smart Aging,” I’m really interested in whether any researchers will specifically target seniors with ResearchKit apps. I’ll be watching carefully when the Apple Watch comes out April 24th to see if seniors buy them (not terribly optimistic, I must admit, because of both the cost and the large number of seniors I help at The Apple Store who are befuddled by even Apple’s user-friendly technology) because the watch is a familiar form factor for them (I haven’t worn a watch since I got my first cell phone, and most young people I know have never had one) and might be willing to use them to participate in these projects. “As much as Silicon Valley likes to think of itself as a force for good, disrupting this and pivoting that, it sometimes forgets that there’s a wider world out there. And when it comes to using devices in the practice of medicine, that world contains three very important letters: FDA. That’s right, the US Food and Drug Administration, which Congress has empowered to regulate the marketing and research uses of medical devices. I remember reading that Apple had reached out to the FDA during development of the Apple Watch, so I’m sure none of this comes as a surprise to them, and any medical researcher worth his or her salt is also aware of that factor. However, the FDA is definitely going to have a role in this issue going forward, and that’s as it should be — as I’ve said before, with any aspect of the IoT, privacy and security is Job One.